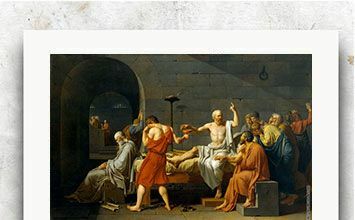 Jacques Louis David was a French neoclassical artist who is best known for his historical, iconic paintings include 'The Oath of the Horatii,' 'The Death of Marat' and 'The Coronation of Napoleon.' Beyond tremendous talent and influence, David proved adept at working with multiple political regimes during the turbulent years of the French Revolution. Bouguereau was a French Academic painter that epitomized the Neoclassical tradition in his idealized bodies and setting. His work was later derided by the Impressionists, who found oldfashined his artistic style and his continued instistance on the Neoclassical approach to art. The portraits by Vigée Le Brun were highly regarded and even Marie Antoinette was a sitter with some portraits scandalous while others more royal. Arnold Bocklin was a Symbolist and Romantic Swiss painter whose mythological and fantastical figures are often combined with bizarre subject-matter. Lord Frederic Leighton was a leading figure in Victorian art and the President of the Royal Academy for almost two decades. His works depicted historical, biblical and classical subject matter. Benjamin West, "Benjamin Franklin Drawing Electricity from the Sky"
Benjamin West for "The Royal Academy of Arts"